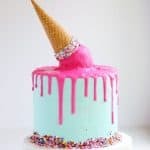 This Upside Down Ice Cream Cone Cake is a vanilla cake with buttercream frosting and what looks like an upside down ice cream cone melting on top. I’ve had this blog for over four years now and thought it was time for a new look. I’m really excited about it. The photos came out great. My friend, Andrea, did a fantastic job. She’s a talented photographer. Check out her website here. Stay tuned for the new web design, coming soon! It’s going to be much more user friendly and I’ll be offering something new, online courses. I can’t wait to share it with you. 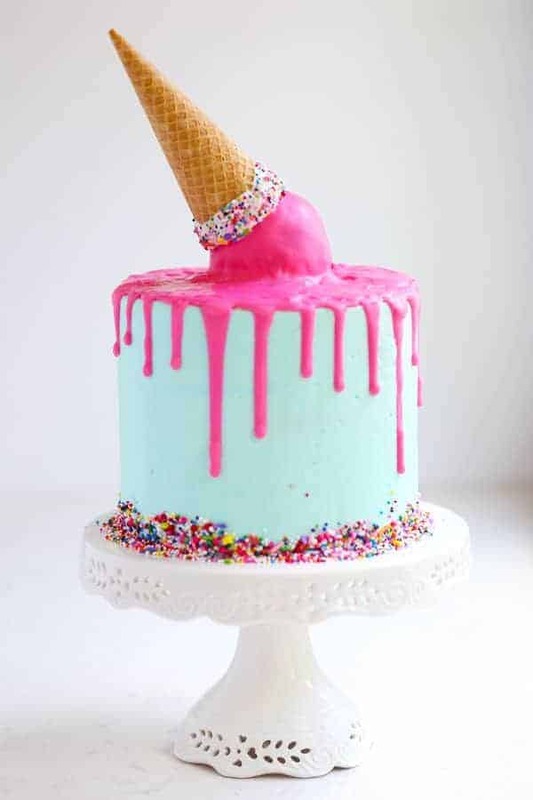 In the meantime, I thought I’d post the recipe for this super cool Upside Down Ice Cream Cone Cake! 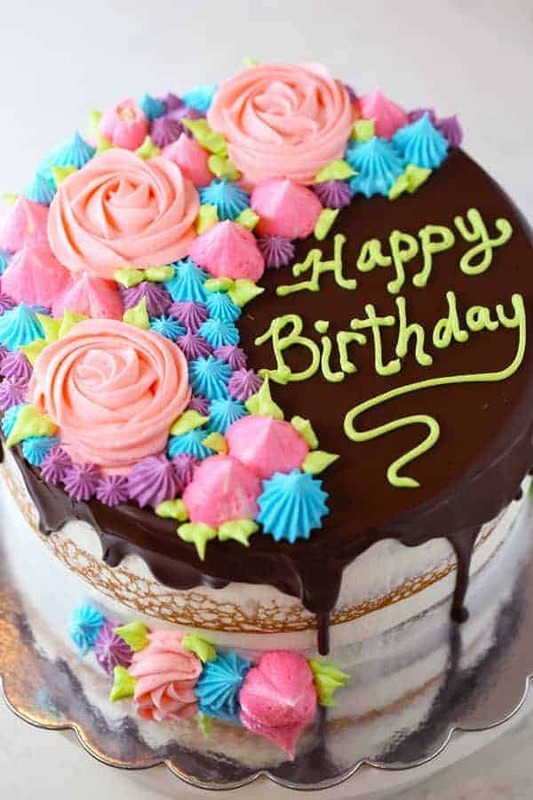 It would be perfect for a kid’s birthday or maybe your favorite adult! It’s also delicious. Enjoy! Preheat oven to 350°F. Grease 3 (6-inch) round cake pans and line with parchment paper. Grease again or spray with non-stick cooking spray. Set aside. Place all ingredients in a large bowl. With an electric mixer, stir on low speed to combine (30 seconds). Then turn mixer up to medium and beat for 2 minutes. Divide batter evenly into the 3 prepared cake pans. Bake in preheated oven for 40-50 minutes or until a toothpick stuck in the middle of the cake comes out clean. Let cool. Level the cakes by cutting horizontally to remove the domed tops. Reserve the cut pieces of cake and crumble into a bowl. Add about 1/2 cup of frosting. Stir into crumbs until combined. Form into 2-3 large cake balls (about the size of a scoop of ice cream). Place in refrigerator to chill for about an hour. Beat softened butter on medium speed with an electric or stand mixer. Beat for 3 minutes until smooth and creamy. Add powdered sugar, cream, and vanilla extract with the mixer running on low. Increase to high speed and beat for 3 minutes. Note: If the frosting is too thick, you can add a little more cream. Just add one tablespoon at a time, then mix thoroughly until you get the consistency you like. 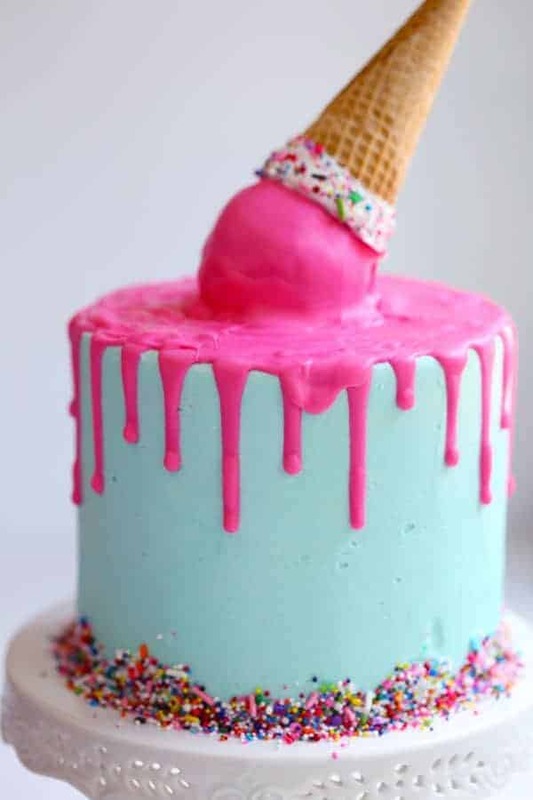 Add a little bit of blue and green food coloring to achieve a pale blue-green color. Stir well. Fill and frost cake with a crumb coat. Refrigerate for one hour. Frost the cake with a smooth finish. Add sprinkles to the bottom sides of the cake. Refrigerate again for 30 minutes. Melt the white chocolate according to package instructions. I did it in the microwave. Be careful not to overheat. Microwave for 20 seconds. Stir. Then microwave for 10 seconds. Stir until smooth. Add a teaspoon of oil. Stir. Dip the ice cream cone in the melted white chocolate then add sprinkles. Put on a parchment lined cookie sheet and put in refrigerator to harden. Dip a lollipop stick into melted chocolate, about 1/4 inch down. Stick in middle of cake ball. Repeat with remaining cake balls. Melt pink candy melts according to package instructions, being careful not to overheat. Add 2 tablespoons oil and stir until smooth. It should be soupy. You can add a little more oil, if needed. Stick a cake ball into the middle of the cake. 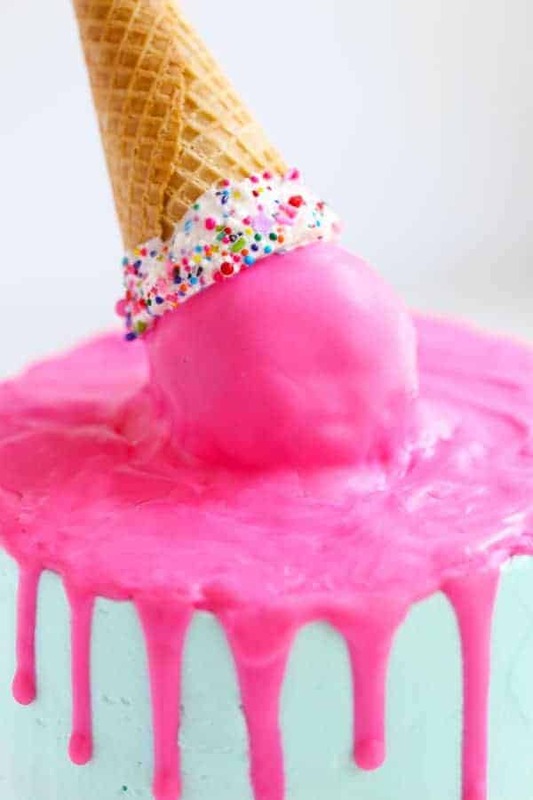 Pour melted pink candy melts over the cake ball and stick the prepared cone on top. Working quickly, drizzle sides of cake, then fill in the top section. The cake is ready to serve. If you like the chocolate drizzles, you might also like this Chocolate Drizzle Semi-Naked Rose Cake. Its look too natural and easy to make it.I will try it. You are extremely talented and it was a lot of fun doing your photoshoot! I loved the colors and your new kitchen (*swoon*) I&apos;m looking forward to seeing the new website!